The good week ended on a sour note because it has been one of those days where Mark and I have bickered like cats over everything from taking out the rubbish to the need to fold clothes after laundry. Yes, we also took our laundry basket over to Auntie and used her washing machine for a few hours, and now we once again have clean clothes. But after, Mark and I clashed when I put the clothes into the drawers without folding them properly. I can’t say that we have any particular reason for the foul moods, but it is like always; we get into a negative downward spin until we follow each other from room to room to tell each other what we really think about things. The storm has passed now, and Mark has been huggy as he is when he wants to make up. But yeah, it’s been that kind of day, and I’m just tired of it. I retreated from the drama to outline the book I have in my head, and reading the notes now it seems like it’s an angry story. A story about power, the desire for power, and the abuse of power. Maybe I should think up a Romance instead. I could have a hero suspiciously like Mark that goes around ripping bodices. Hey, it would be a proper gender bender LGBTQ romance, then. And of course, now when I look over at the laundry heap that hasn’t been folded, there’s an orange leg sticking up into the air in the middle of it. Not much else of George can be seen. He has found his spot. 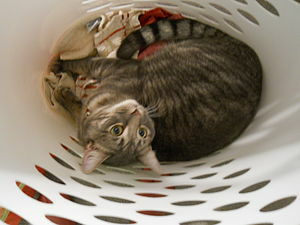 In our clean laundry. Sigh. Previous Previous post: Has it been a week already? Would be quite a boring life otherwise, wouldn’t it? George is a cat, and that’s what cats do. Especially if said laundry has just come out of the dryer :).